Every day approximately 50,000 web pages filled with information come online—ranging from the weird, the wonderful and the wacky to the serious, the subjective, and the spectacular. With a plethora of choices out there, we rely on algorithms to sort and rank all this information to help us find content that is authoritative and comes from credible sources. A constantly changing web means we won’t ever achieve perfection, but we’re investing in helping people understand what they’re reading by providing visual signposts and labels. We add clear labelling to stories in Google News (e.g., opinion, local, highly cited, in depth), and over year ago we launched the Fact Check tag globally in Google News and Search. And just recently we added information to our Knowledge Panels to help people get a quick insight into publishers. Today, we’re announcing a move toward a similar labeling effort by the Trust Project, which is hosted at the Markkula Center for Applied Ethics at Santa Clara University. 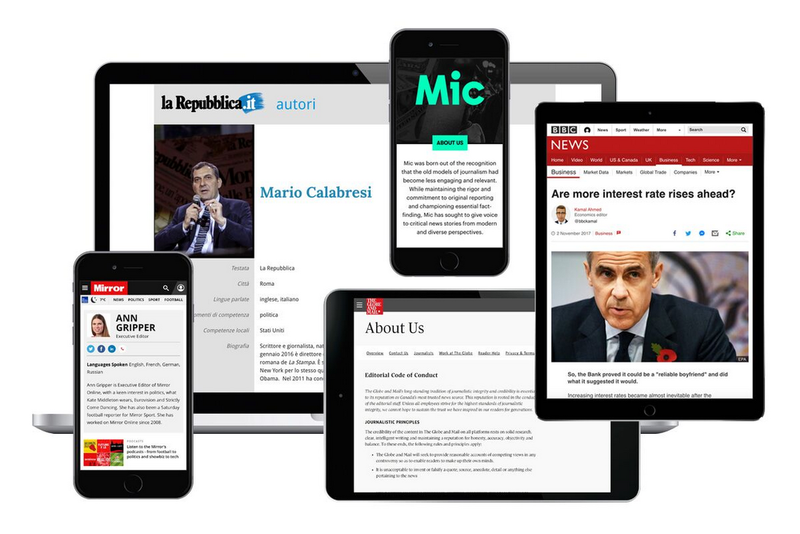 The Project, which is funded by Google among others, has been working with more than 75 news organizations from around the world to come up with indicators to help people distinguish the difference between quality journalism and promotional content or misinformation. Best Practices: Who funds the news outlet and their mission, plus an outlet’s commitments to ethics, diverse voices, accuracy, making corrections, and other standards. Author Expertise: Details about the journalist, including their expertise and other stories they have worked on. Citations and References: For investigative or in-depth stories, access to the sources behind the facts and assertions in a news story. Methods: For in-depth stories, information about why reporters chose to pursue a story and how they went about the process. News publishers embed markup from schema.org into the HTML code of their articles and on their website. When tech platforms like Google crawl the content, we can easily parse out the information (such as Best Practices, Author Info, Citations & References, Type of Work). This works like the ClaimReview schema tag we use for fact-checking articles. Once we’ve done that, we can analyze the information and present it directly to the user in our various products. Our next step is to figure out how to display these trust indicators next to articles that may appear on Google News, Google Search, and other Google products where news can be found. Some possible treatments could include using the “Type of Work” indicator to improve the accuracy of article labels in Google News, and indicators such as “Best Practices” and “Author Info” in our Knowledge Panels. We believe this is a great first step for the Trust Project and look forward to future efforts as well.